Introduction: Surgeon-technology interfaces are a vital factor contributing to ergonomic risk. The display monitor is one such interface associated with physical eye and neck symptoms experienced by laparoscopic surgeons. The development of new technologies has permitted the traditional CRT display stationed on an instrument cart to be replaced by LCD system located on a boom. In the largest North American survey of its type to date, we investigated whether laparoscopic surgeons really benefit in terms of better ergonomics and reduced physical symptoms from the newer display systems. Methods and Procedures: 317 laparoscopic surgeons currently in practice participated in this online survey study. This comprehensive, 23-question survey addressed four categories: demographics, physical symptoms, ergonomics, and environment/equipment. Data were analyzed using chi-square and logistic-regression. Results: Neck stiffness (49%) and eye fatigue (31%) were among the most prominent symptoms. 67.4% of participants reported using an LCD system though 25% of participants still have the monitor cart mounted. Surprisingly, our study data showed that the percentage of participants experiencing eye strain and neck stiffness did not differ in terms of display type or mountings (p>0.05, p>0.05). 71% of stationary display users as well, surprisingly, as 48% of those with mobile mounts still requested improvements in regard to monitor positioning. While 65% of CRT users asked for better resolution, it is notable that 48% of LCD users also wanted to have improved resolution. No significant differences were found between CRT and LCD users in terms of their demands for improvements regarding display monitor size, color, and number. Conclusions: Monitor placement has been assumed to be a major factor contributing to ergonomic risk. The LCD display mounted on a mobile boom has been considered to offer the best ergonomic option available. 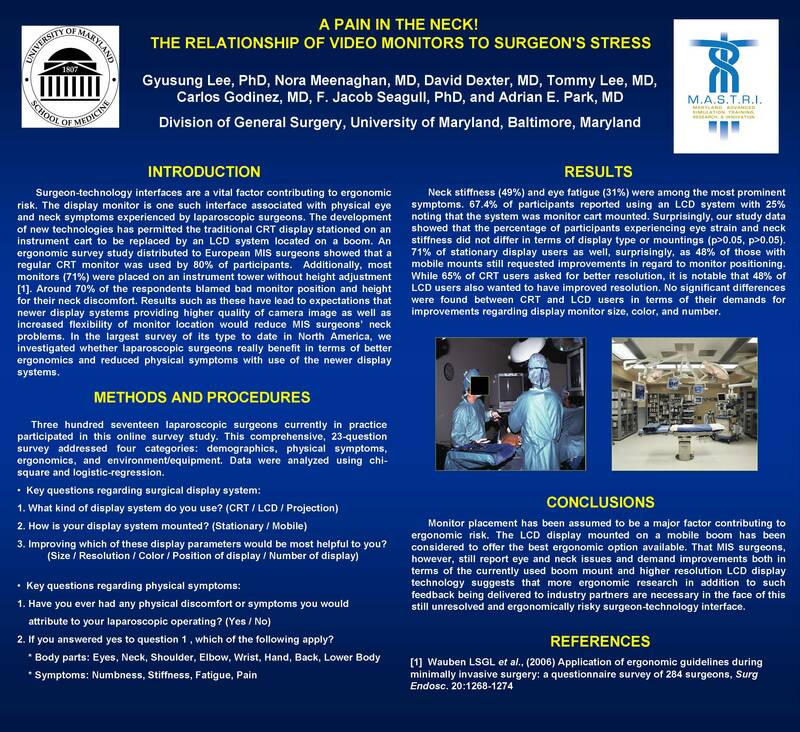 That MIS surgeons, however, still report eye and neck issues and demand improvements both in terms of the currently used boom mount and higher resolution LCD display technology suggests that more ergonomic research in addition to such feedback being delivered to industry partners are necessary in the face of this still unresolved and ergonomically risky surgeon-technology interface.